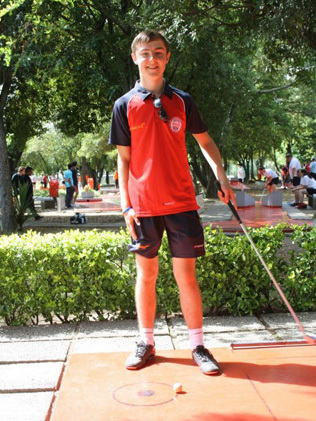 Over 3 days in August last year, 6 British minigolfers competed at the elite 2012 European Minigolf Championships in Portugal, sponsored by us here at UrbanCrazy. 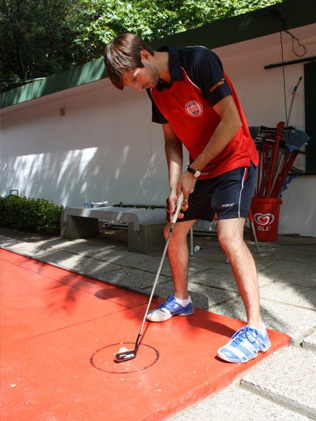 Those players were British Team captain Marc Chapman, seasoned UK tour pro Tony Kelly, twice Kent Open winner Seth Thomas, Cambridgeshire Club captain James Rutherford, the team’s youngest player Freddie Blackburn-Shaw and 2009 London Open champion Adam Kelly. UC: What were your impressions of the event and overall experience? TK: Coming as it did just two weeks after the Olympics, it was a particularly proud moment for me to put on my new GB team kit and carry the flag at the opening ceremony in Porto in August 2012. Not many people get the opportunity to represent their country at a major sporting event, and nobody who was in Porto last summer could be in any doubt that this was ruthlessly competitive international sport, played to a very high standard. FB-S: The overall impression was of the intensity of both the competition and practice days. The European teams seemed almost professional compared to us. JR: My experience in Porto was one of mixed emotions. After my GB debut at the same course earlier in the year at the Nations Cup I had high hopes of doing far better in August at the European Championships. I did improve on my previous 8 round total of 224 by 7 shots. (UC – that’s a new British record!) However, I was left with a bitter taste in my mouth. After day one I had been on the cusp of achieving something very special by finishing in the top half of the field, but a torrid day two led to the somewhat inevitable disappointment. AK: The European Championships was a phenomenal experience, held at a fantastic pair of courses. 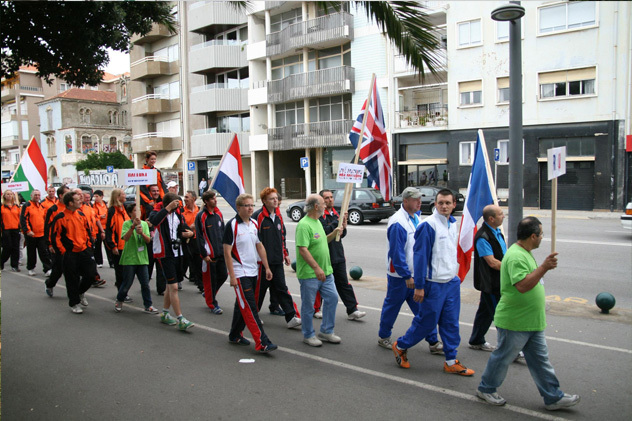 The Great Britain team all put in a great effort, both in training and competition, and enjoyed the time on and off the course. AK: My personal highlight of the competition was breaking the record for the lowest ever round by a British player, with a 20 in round three. 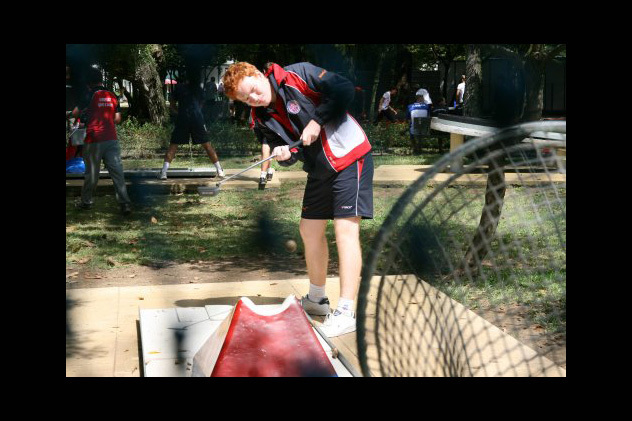 (UC – that’s only two strokes shy of the perfect round – minigolf’s holy grail!) 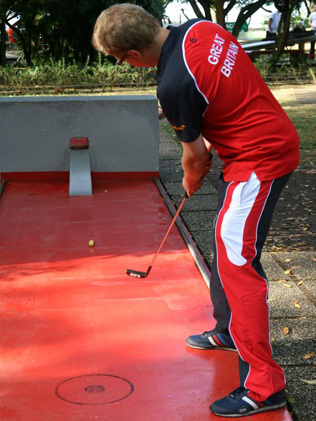 The pressure of playing the final five holes knowing that I was in with a chance of breaking the record was different to any pressure I’ve ever felt in UK competition due to the precision required and the fine margin of error on the miniature golf course. TK: We made a lot of friends, learnt a lot and it was a privilege to play alongside some of the best players in the world. Our young team performed with great credit and they can only get better with experience. The highlight was watching Adam’s round of 20 unfold while I was preparing to play my own round. FB-S: My personal highlights were scoring 24 (UC – Freddie is the youngest Brit ever to score a 24 in competition) and keeping up with Reto Sommer who eventually came second, and then getting his Swiss shirt to keep! JR: The game in Europe is of course an individual sport; one man and his putter, but the one thing that struck me very strongly was the team spirit amongst the highest achieving teams such as Germany, Sweden and Switzerland. They showed genuine delight at their team mates achievements. UC: Any good anecdotes about the trip? TK: There was an interesting incident on the flat loop hole during one of my rounds. My Dutch opponent hit the ball over the loop only to see a bird dropping land on the ball and deflect its path towards the hole. He called the referee over, she examined the ball and allowed him to replay the shot which he aced. AK: It has to be said most of the best off course moments involved Freddie! Particularly memorable were his efforts to attract female attention at the closing ceremony, and his excitement when offered a dance during the evening’s entertainment! FB-S: Off the course, Seth somehow breaking his toe on the squash court was a highlight, but the whole week was good fun. UC: Do you have any final thoughts and reflections? JR: I now feel a burning desire to improve and achieve at the European game and will be travelling to Eskilstuna Sweden to attempt to enhance my ability at the very precise and delicate courses that feature so heavily in Europe. I also hope to be selected for Great Britain once again as we attempt to improve on our team performances which after all is the most important thing. AK: The game in Europe is very different to that which we play domestically, and the European Championships was a valuable experience in developing the skills of all the team members. FB-S: I made some good friends, was given lots of advice and learned a huge amount especially the mental aspect of dealing with pressure. 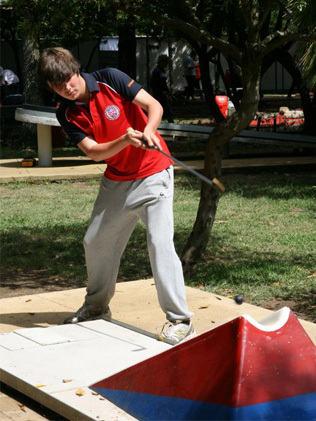 I definitely want to play in the junior championships in Portugal this summer. TK: Many thanks to the BMGA and UrbanCrazy for giving me this opportunity and providing me with fond memories which I will always cherish. UC: A big thanks to the players for their insights into the world of ultra-competitive minigolf from all of us here at UrbanCrazy. 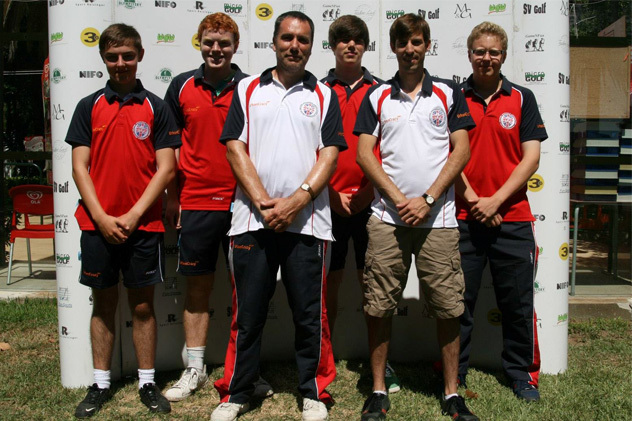 We look forward to supporting the team again in 2013 and wish all the BMGA tour pros a successful 2013 season. 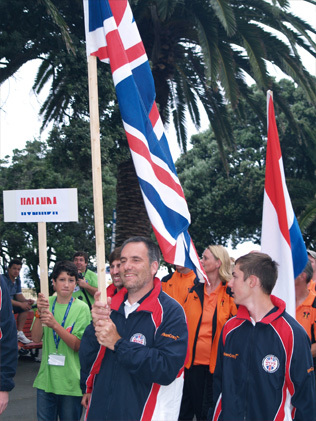 Thanks to the official Porto 2012 website and to Tony Kelly for the photographs.